Unique opportunity to purchase a well established charter business operating out of Derby in Northern WA. The charter vessel is a 2007 12m aluminium Cat powered by 2 x 310HP Volvo DP310 diesels with only 1200hrs. Vessel speed 26knots and cruises at 18 knots. The vessel is in 2C survey for 10 passengers and 2 crew. 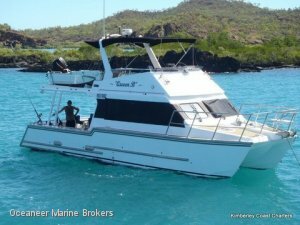 This is a well maintained reliable charter vessel. A great lifestyloe business opportunity. FTOL available by separate negotiation. Please call Oceaneer Marine for full inventory details.